It is a common practice in the natural gas industry to use sites of former gas or oil reservoirs for storage uses. These natural gas storage sites are a key component of natural gas transportation and distribution networks, since they facilitate the balancing of supply, which is relatively stable and limited by transportation network capabilities, and demand, which varies based on the weather. To ensure gas network efficiency and reliability, natural gas is stored near consumption zones in low demand periods in order to be able to meet the increased demand in winter. The role of storing natural gas can be grouped into two main categories: operational and commercial. From an operational standpoint, natural gas storage is a valuable tool for offsetting supply/demand imbalances. Given the considerable investments involved in producing and transporting natural gas, it is best to maintain a stable, steady supply year long. For example, the transportation network users aim for a 100 % load factor (daily use divided by peak use) resulting in lower operating costs. On the other hand, demand for natural gas fluctuates from one day to the next for a host of reasons, namely weather. Storage sites are therefore tools that make it possible to efficiently offset seasonal and daily imbalances between supply and demand. Storing natural gas near consumption centers also increases security of supply. From a commercial perspective, storing natural gas makes it possible to take advantage of business opportunities available on the market. For example, storing natural gas allows companies to reduce supply costs by buying and injecting gas in the summer when demand and prices are low, and extracting it in winter when demand and prices are higher. 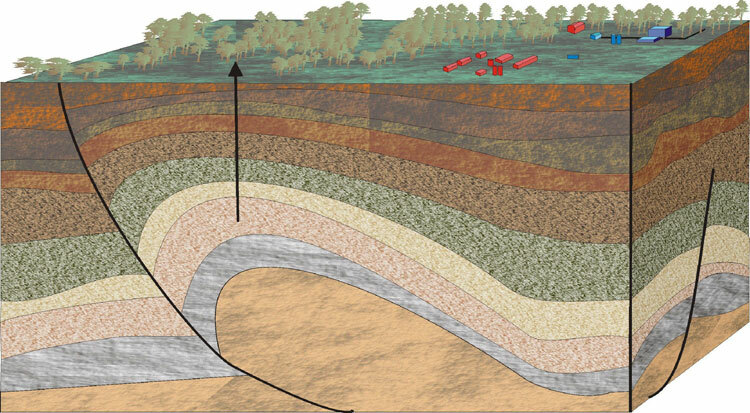 Depleted reservoirs, aquifers or salt caverns: these are the most common storage sites, but they require very specific and thus rare geological configurations, hence the importance of geophysics and the drilling process in the identification of potential sites. The type of reservoirs used depends on the geological formations available. A completely natural way to store gas is to place it in depleted gas or oil reservoirs. When their geological characteristics allow, depleted reservoirs can be converted into underground storage sites. This involves reinjecting natural gas into geological formations that have already been storing hydrocarbons for thousands or millions of years, and that in a very safe manner. The production wells are then adapted to their new purpose, and a central plant (compression, dehydration, etc.) is built to manage the entire facility. This technique was used with the two storage sites Intragaz operates in Pointe-du-Lac and Saint-Flavien. Aquifer storage sites are developed in geological formations that are similar to depleted gas reservoirs. They are created by injecting pressurized gas into porous zone. The gas progressively replaces the water without altering the underground architecture. The domed rocky structure is a true natural reservoir and is topped by a leaktight cover of impermeable rock that confines the gas underground. These storage sites are made up of a group of caverns that are hollowed out of thick and deep layers of rock salt. Because they are impermeable and non-porous, they are remarkably leaktight. Caverns are created by injecting water to dissolve part of the salt, which is extracted in the form of brine (a mixture of water and salt). This brine can then be used to supply industries that use it as a raw material. The space freed up in this way can be injected with natural gas under high pressure in gaseous form, which is later withdrawn simply by releasing pressure.